Big clouds have become kind of a status symbol for those of us in this industry! Some are all about the bigger the better, chasing the craziest devices to get the craziest level of vapor, and some are all about using that vapor to get down n dirty, putting it to work in the form of tricks. Vape tricks. Have you heard of this new subculture phenomenon? Know a few well enough to perform them at parties? Invented your own? Want to learn how to do ‘em? Well, in the vape world, vapor is king, and doing vape tricks is like icing on the cake. Not necessary, but an absolutely fun part of playing with that vapor. Here’s a little more about this ever so popular novelty, and how to do some of the most basic tricks. Hey, working with electrical units, perfecting your vape pen, getting the right voltages and watts is important and all, but you gotta be able to kick back and chill too sometimes! Like the classic old smoke rings every smoker mastered at some point in their tobacco tenure, vapor rings of the same effect are quite amusing indeed! How to create vapor rings: Inhale the vapor into your throat, keeping your tongue at the bottom of your mouth, edging towards the back of the throat. 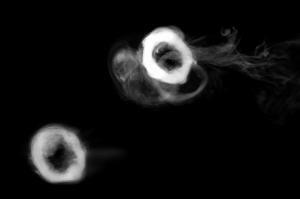 Put your lips into an “O” shape, and release a small amount of vapor in a single little pulsing motion at a time. The vapor should emerge in an “O” matching your lips! The Ghost Hit creates a mushroom cloud effect. Here’s how to do it: Take a long drag of vapor and allow it to rest in your mouth for a few seconds, then push it all out in a ball, quickly inhaling back in. The Dragon allows you to masquerade as a dragon, with vapor spewing out both corners of your mouth as well as your nostrils. To master this: Take a long drag but do not inhale, and once your mouth is full of vapor, exhale it powerfully out your nose, and the sides of your mouth all at once. Ferocious, indeed!